The Cuba Libre cocktail was invented around 1900 in Havana, which was during the Spanish-American War. Rum goes well with lots of soft drinks and there are many types of rum. This simple cocktail, is effectively a highball. The rum and coke probably would have come around sooner had the dark cola been developed on the island instead of in the USA. 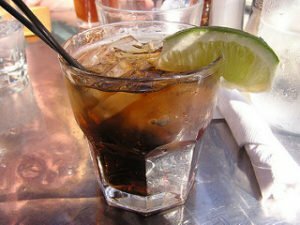 Of course, you can probably think of a pile of other variations of the standard Rum and Coke. Have fun with it! Try coconut rum with a diet Vanilla Coke. Maybe Cherry Coke with some spiced rum! As with the many flavours of vodka, manufacturers like Bacardi are experimenting with orange, melon, peach, apple and raspberry flavoured rums to increase options for their customers. A great rum though just needs a little aging to let the harshness mellow out. For a lighter rum, the Havana Club 3 year is a nice light rum for sipping or mixing. Try a little authentic Cuban rum in your next Cuba Libre, then sit back and enjoy. This drink can be made a whole lot simpler. As with any rum and coke, you add ice to a highball glass, then pour in a healthy shot of your favourite rum. Top off with a freshly cracked can or bottle of Coca Cola. Garnish with a lime and serve. No need to get complicated with the extra shaking.